Located next to Buxton Harbor, with a private deck overlooking trees and marsh, with the Albemarle Sound in the distance. Room has queen bed, mini fridge, microwave, coffemaker and private bath. Walking distance to two restaurants, five minute drive from Cape Hatteras lighthouse and beautiful beaches. Local flavor, owner willing to answer questions and make suggestions about the area. Newly renovated! I am an artist who has lived on Hatteras with my husband, also an artist, for 39 years. I now continue to live and work on Hatteras by myself. I play guitar and other instruments, sometimes in local venues. My work is part time at a beautiful gallery in Avon called Kinnakeet Clay, where I create various items from slabs of clay that we sell in the gallery. We bought this property after living here for many years. My husband was an avid fisherman, gardener and painter, and living on Hatteras Island gave him opportunity to do all of these things. We enjoyed the small island community and I am glad to still be living here. Tiled shower and pedestal sink, adjoins the bedroom. Located in the village of Buxton. Restaurants, grocery store, shopping and beach in close proximity. Sound view from bedroom deck. Sound view through trees and marsh. Central heat and air, fan also. Washer and Dryer available downstairs in the main house . Washer and Dryer available downstairs in main house. Coffee, microwavable hot cereal and tea. Wine glasses, water glasses and coffee cups. Paper plates, silver utensils, knife and paper towels. A vintage enamel dining table for two. 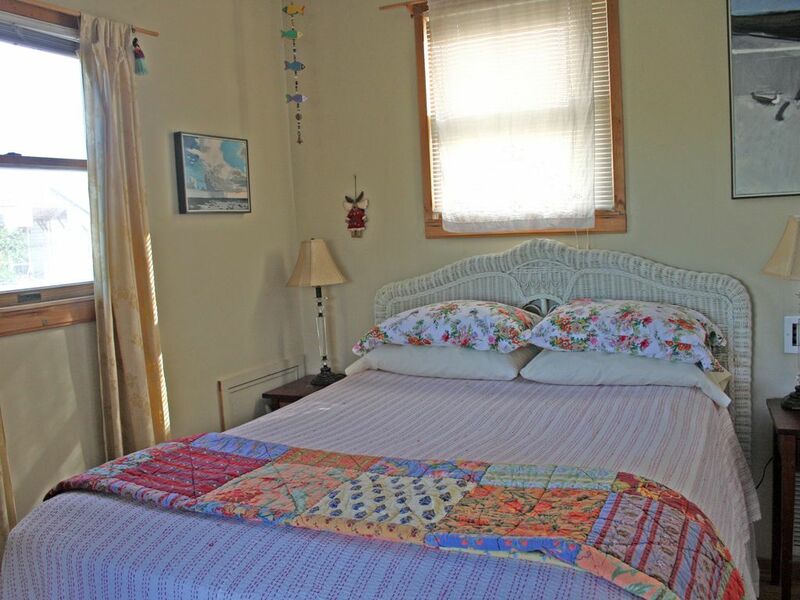 Very clean quaint little place that’s out of the way yet very close to area attractions. The owner was extremely accommodating; she texted us at 0730 and told us to come whenever we could get there so we could get settled in before a pretty decent storm came through. We hope to stay here the next time we visit Buxton. Awesome stay just as described, would stay again for sure!!! A week away from the world! Just for the record I've never stayed at a place without a television. It kinda forced me to read ..and Lisa had some interesting books. Her place was quiet and comfortable and full of interesting art. I liked the deck most of all...the sun would set on the deck and would present a wonderful sunset! I went down there for peace and solace and found it! Thank you Lisa for your hospitality and I will try to make it back. This is a great peaceful room. It is beautifully furnished with interesting art to look at. It has a very comfortable bed, all basic equipment that one needs to stay and even make a simple meal. We loved it! Thank you. The Cape Hatteras Lighthouse is a destination spot for people all summer.